Amazing, this image is doing so well (6.77 atm) and that after I hesitated to submit it because the original wasn't really a great silhouette. When I took this shot, I didn't even know about the challenge: I was on holiday on the Isle of Mull and we had no phone, no tv and no internet. Once home I noticed the challenge and remembered taking this shot. On my camera display it looked ok, but when opened in Lightroom there were too many details visible and the sky was quite bleak. 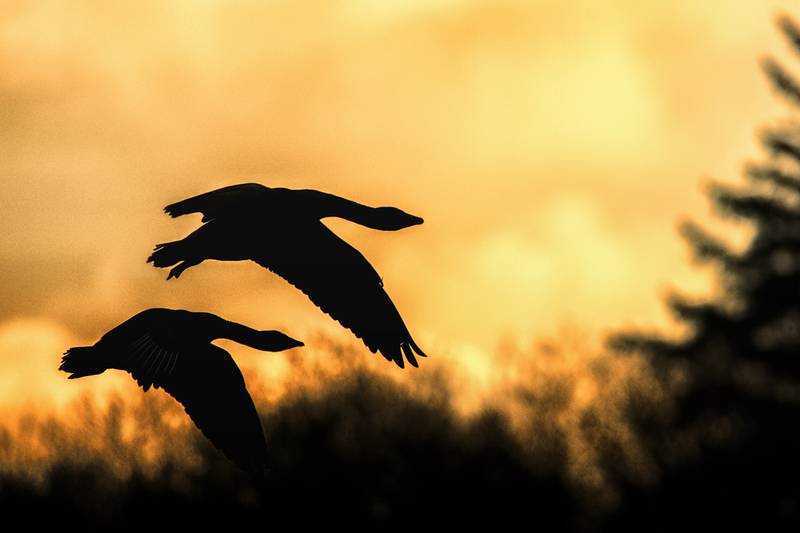 I decided to give it a go, and first I made the birds much more silhouettish using selection and an adjustment layer and I added some warmth and yellow to the sky to make the image more striking. Using Analog Efex I was able to restore some structure in the sky and it added some grain to the sky as well. Et voila! No matter how it will end tomorrow, thanks for your votes and comments, much appreciated! Love the beauty of this image with the exact same wing emotion, a gorgeous pic, top three for me. Proudly hosted by Sargasso Networks. Current Server Time: 04/22/2019 04:55:08 PM EDT.